If yours is not an FAQ, please email kate.joyce@mosaicinc.org to ask your questions. Is this only available to professional artists or artists involved with Mosaic Community Services? 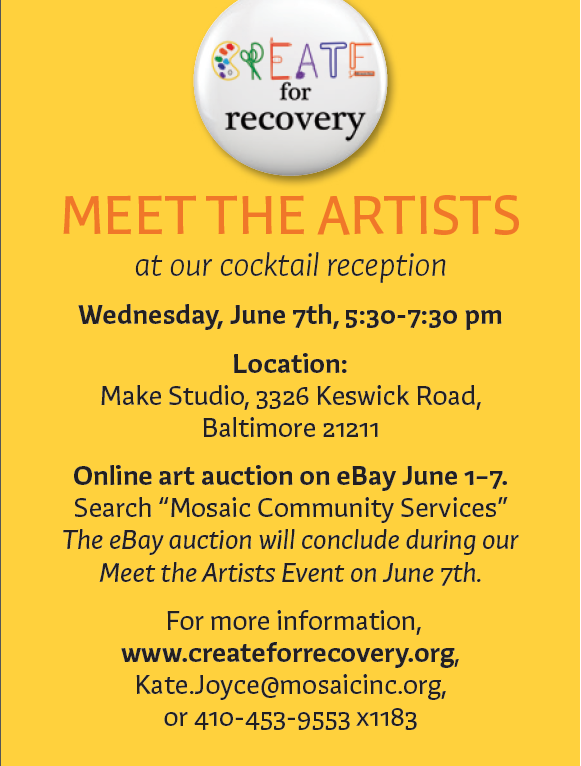 Create for Recovery is open to everyone! Professional, amateur, local, long-distance, friends and strangers. No. There is a not a theme for this year’s campaign. I don’t have experience with fundraising, what do I do? Fundraising sounds intimidating, but it can be fun to get your friends and family to show their support by helping you reach your goals. Once you set up your page on https://www.crowdrise.com/CreateforRecovery, we’ll help you out with some notes on sending out emails and updating Facebook. We’re here to help.